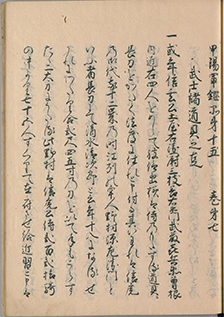 The following is a selection of ten articles from Shingen's 99 Articles. 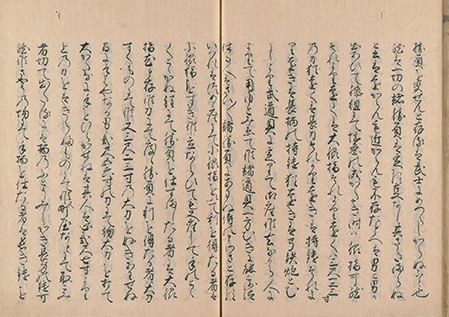 These articles provide a glimps into the concerns of a military lord of the Sengoku period. Among these we can identify loyalty, obedience and bravery are especially important. Within the context of the turbulant nature of the period, it is not surprising that a military lord such as Shingen is trying to codify warriors behaviour. 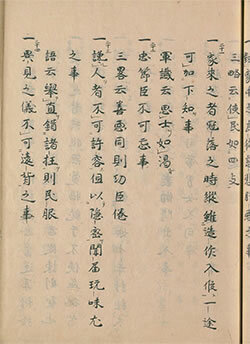 Another matter that stands out is the regular reference to Chinese military records. 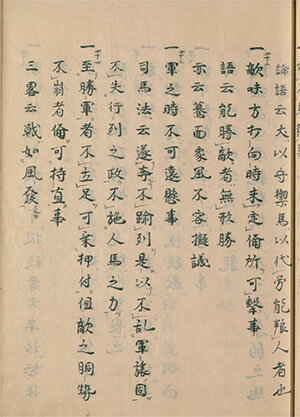 The antiquity of Chinese culture and records, and their breadth and depth, has always been treated by Japanese with awe. 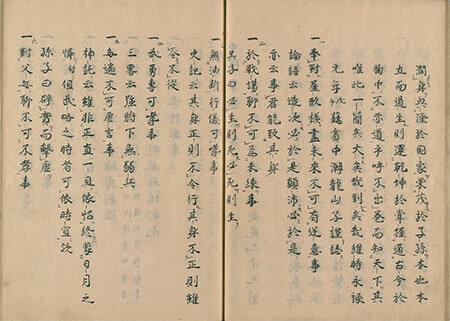 In this case, Shingen is using Chinese records to support the truthfulness of his Code. 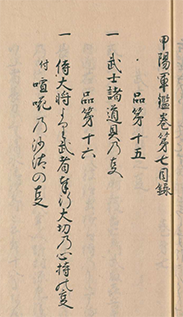 It is also not unreasobable to consider that the 99 articles were not compiled directly under Shingen's supervision but instead by the editor of the Koyogunkan in the early Tokugawa period when New-Concucianism became a major source of Tokugawa ideology. 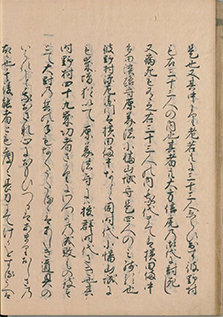 Nevertheless, these articles are a valuable source for understanding the minds and hearts of the Japanese samurai, but should be read through critical eyes. *More articles will be added. 4. You should fully set your heart on valour. It is said in Sanryaku (Ch. Sān Lǜe), “There are no weak soldiers under [the command] of a strong general. 16. You should set your heart on the two characters in the compound “kannin” 堪忍. It is said in old writings that young Kanshin 韓信 (Ch. Han Xin; a general who played a key role in the founding of the Han dynasty) tolerated the humiliation when he was made to crawl [on the ground]. 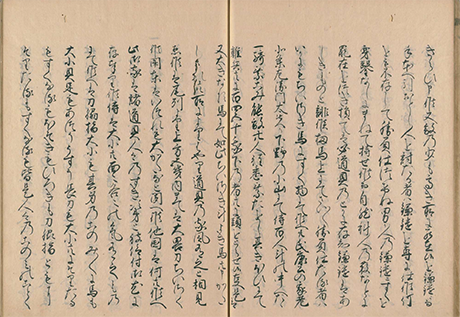 In his later years, as a retainer of the Han, he viewed “enduring heart (shinobugokoro)” as of the utmost importance. 17. Do not breach neither big or minute orders. "Water adjust to the any shape of a container." * Shingen uses this as a metaphore to retainers who, regardless of the conditions of their surroundings, or whether they like it or not, need to accept and comply. 23. You cannot tolerate a person who bad mouths for the purpose of gaining another’s favour. However, in the case of spies it is a different matter. Inquire and confirm [relevant] matters. 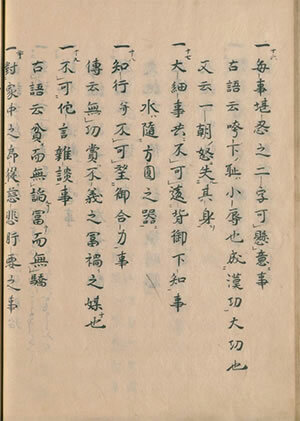 It is expressed in the writings that people will become obedient just as placing a strait board on a curved board will straiten it after some time. 43. When departing camp [for battle], do not remain behind your general for even one day. It is said in Rongo 論語 (Ch. Lúnyǔ), “The heart aches when the bell rings to retreat, but it is elated when the drum [signals] the army to advance. 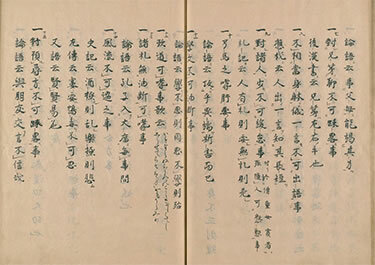 Shingen ordered four low-ranking retainers to deliver a written letter to the commander of the Office of Military Affairs of the Obu (飯富) house, stating that “Now that warriors have become many, there is a need to conduct an inquiry among senior retainers in consideration of which weapons warriors prefer to carry. Having received the letter, the Obu commander stated that since this will not be limited to a council meeting, they will first gather their own thinking [about the matter], as well as inquire with other people. Then, when the concept is clear they will report, and ask for [Shingen’s] opinion. Concerning this matter of weapons, it is absolutely natural for warriors to be thinking about how to achieve victory. However, there is no single method to implement in order to achieve victory. Such a method is not determined because no one knows it. For example, when two men are sitting facing one another in a meeting, and a fighting erupts because they lose their patience, a small short-sword (wakizashi 脇差) is sufficient. If the distance is longer, a 2 shaku 6-7 sun sword [is sufficient], and if for a longer distance, a 3 shaku 2-3 sun [is sufficient]. Yet, for a longer distance [use] a glaive (naginata 長刀) , and for a longer distance than that [use] a spear (mochi-yari 持鑓). 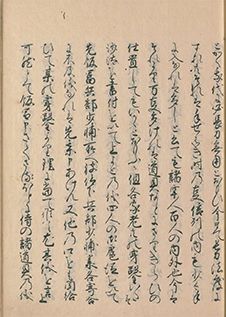 For a longer distance [use] a long-pole spear (naga-e no mochi-yari 長柄の持鑓). Yet, for a longer distance [use] bow (yumi 弓) or a firearm (teppo 鉄砲). Such has been determined since of old. However, each person has his way of using [weapons]. As for weapons, a samurai who says that it is better to think of using weapons on one side only, is thought to be the saying of one who has not engaged in battle. For a person sitting at the low-rank position, being armed with a small short-sword is advantageous. For a person who is in either sitting position or in a line-up and due to distance can barely reach [his opponent], a long short-sword (O-wakizashi 大脇差) is better. A person who has often benefited from using a sword in combat, would favour a long sword. A man with a fast hand would prefer a 2 shaku 5-6 sun sword over a long sword of 3 shaku 2-3 sun that takes a while to draw. That person would dislike a sword that is over 2 shaku 7 sun long. Then, in case of a need to cut down or stab a wanted person at the merchants quarters of a town, it is better to use a long-blade spear with a short, thick pole. A warrior who wishes to be credited [for subduing] in such a place, would dislike a long spear. Also, if an enemy is located in a slightly higher place, the warrior would only use a sickled spear, for with a sickled spear a warrior can hook and pull down the enemy. A man with no combat experience, who imitates another who favours sickled spear without inquiring about the matter first, would then blame the weapon for his failure to perform in attempting to subdue a criminal in hiding, and say bad things about it. * the author is using this example to emphasize his view that the skills and success or failure depend on the warrior and his choices and not on the weapon. That is, each person has his strengths and weaknesses, and selecting the weapon that best fits him for a particular need is most important. A warrior cannot blame the weapon for his failure. Now, a mounted warrior who fights on a busy battle ground would prefer a small horse. However, in the battle of Oyama in Shimotsuke province, the lord Hojo Ujiyasu’s senior retainer Hojo Saemon taifu Tsunanori galloped alone into a group of one-hundred enemy mounted warriors, and took down some twenty strong warriors single handedly. With his remaining strength he joined the lower ranks, together with foot soldiers and others, and collected some 140-150 enemy heads. This was made possible because of his big horse. Therefore, preference is not limited to small horses only. Trends in weapons depend on regions. From Owari provice upwards to the Five Kinai (Go-kinai 五畿内) regions, [the trend] is a short sword. Anywhere in the Kanto region you will hear [that the trend] is a long sword. Regardless of other provinces, the Takeda House takes the approach that each warrior should arm himself with his own weapon of preference. Since among the samurai there are those with big stature and small stature, and of different personal character, and since their weapons as well, being short sword and long sword, or big weapon or small weapon, there should be a fit between [a warrior and his weapon]. It is the same with matters of small and big horses, thick and thin [armour] features, the blade curvature—shallow or deep—of glaive (naginata 長刀), short or long, a narrow or a wide blade, shallow or deep curve for the long and short swords. It is best to order to respect the wish of each person to select his weapons according to his own personal preference. It would make fighting difficult if each person could not carry his preferred weapon. If a person [is forced] to imitate others without inquiring [what is best for himself], no matter how strict the order [to fight], it is thought that he will not be able to make good usage of the weapon. A samurai who is minded about his weapons should be allowed to carry the weapons he favours. 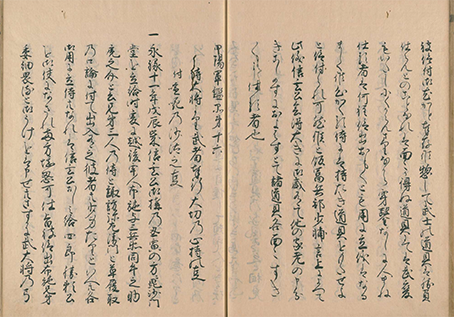 This report by the Commander of Military Affairs of the Obu house satisfied Shingen. Having concurred with that, [Shingen] did not proceed to hearing the opinion of other senior retainers, and accepted the approach that weapons should be selected based on personal preference.